Giving your hens tasty treats doesn’t have to be elaborate or expensive. In fact, you can feed them seasonal favorites as they ripen in your own garden or arrive in your pantry or refrigerator. While you and your hens are enjoying the same delicious foods you are adding needed protein, vitamins and minerals that will wind up in the eggs you eat. According to the American Egg Board, eggs provide people with choline (which contributes to things like fetal brain development), lutein and zeaxanthin (contributing to eye health), phosphorus, selenium, and riboflavin. And, of course, eggs are a great source for protein. These things come to hens in their food sources, including through treats. At the same time, treats may influence the flavor of eggs. For instance, if hens consume onions, onion greens, garlic, fish and cheese, their eggs may have a take on a hint of these flavors. Even cabbage can result in cabbage-like flavor in the eggs. Dr. Tom Tabler, extension professor, Mississippi State University Extension, Department of Poultry Science explains that eggs, like milk for cows or honey for bees, are a byproduct of a system. Just as milk or honey can take on the flavor of seasonal plants consumed or visited by the animal, so can eggs. Here are seven tasty treats you can feed your hens throughout the year that are also packed with nutrition to support healthier eggs. The stunning colors of ripe tomatoes are attractive to your hens, and while they gobble up this tasty treat, they’re benefiting from natural calcium, magnesium, phosphorus, choline and vitamins A, C and K.
Summer or winter cabbage and other leafy greens provide your hens a source of protein, vitamins A and C, folate, calcium, iron, magnesium, phosphorus, potassium, and selenium. Hang this fresh veggie in the chicken run, offering an enticing treat that will keep you chickens well-entertained as the peck at it. This autumn crop is a great source of vitamins A and C, folate, choline, calcium, magnesium, phosphorus and potassium. Pumpkins are another vegetable that hens find interesting to eat—pecking their way to a clean pumpkin skin. A great source of magnesium, potassium, phosphorus and calcium, blueberries also provide vitamins A, C and K, as well as choline and folate. They also offer chickens a natural source of antioxidants. A cool summer treat, this juicy fruit’s color and flavor are attractive to hens, while also providing them with vitamins A and C, folate, choline, calcium, magnesium, phosphorus, and potassium. During the coldest winter weather, oatmeal can be both warming and nutritious. A source of protein, folate and choline, calcium, magnesium, phosphorus, selenium and potassium this pantry-ready treat is easy to prepare and popular when served. As long as the eggs are well-cooked (and virtually unrecognizable as eggs), they can provide hens with sources of vitamins A and D, folate, choline, calcium, magnesium, phosphorus, potassium, and selenium. They’re also an excellent source of protein. Prepared firmly, they will be well disguised to your hens; serving them undercooked or raw can encourage egg-eating in your flock. 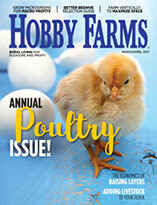 Tabler cautions that while treats offer your flock variety and nutrition, they should be available on a limited basis. A variety of treats should go along with a balanced diet, he explains. 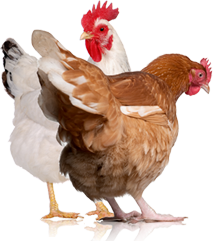 If hens go off laying, start producing thin-shelled eggs or eggs with no shells, that can be an indicator that they are be consuming too many treats and not enough of their balanced feed. 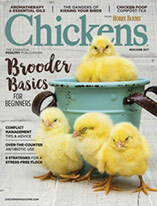 Treats should not be chickens’ main source of food. Offering your flock treats can be an interesting opportunity to observe which they favor or leave behind. It can be an opportunity to notice what your flock is consuming when free ranging and what they might need as the seasons change.